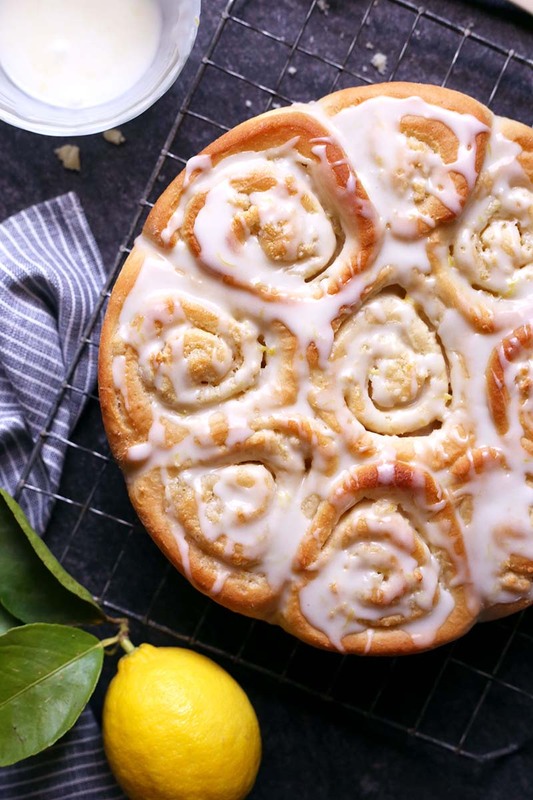 These sweet rolls feature an almond paste and lemon filling with a sweet glaze topping for a scrumptious breakfast treat! tablespoon at a time while kneading). baking dish (or two 9-inch round pans) with nonstick spray. and let rise in a warm place until doubled in size, about 30 minutes. While the rolls rise, preheat oven to 350°F. Bake rolls for 18 to 19 minutes, until golden. small bowl. Drizzle glaze over warm rolls. Wrap leftover rolls well and store at room temperature up to 2 days; warm in a 300°F oven before serving. I was wondering if, instead of grating the almond paste could it be placed in the food processor with the lemon zest and sugar, pulsed until well mixed? Seems to me that it might be easier then grating the almond paste. I have another question – instead of making sweet rolls, can this recipe be used to make a coffee cake by fitting the dough into the prepared 9 x 13″ baking pan, topping it with the filling and maybe a little crumb topping and baked? We have not tried that method for the almond paste, but let us know if it works well for you. Does anyone know what type of almond paste it is that can be grated? I’ve only ever seen it in a tube. Here’s what Tutti Dolci used for this recipe: I use Odense brand almond paste. It does come in a tube, but I just cut the tube in half (that’s about 4 oz), and then grated it with a microplane grater/zester. Carol…it only took me a year to see your reply!! And thank you…I guess when it comes out of the tube, it’s dense enough to grate? Haven’t used it in a while, but this recipe looks just too good.